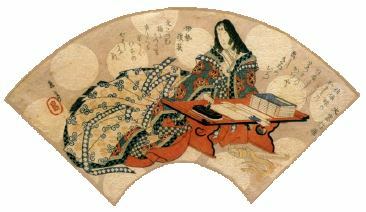 The plum blossoms are open on the tree outside my window, and that reminds me - I'm overdue for getting started on the spring issue of the Hyakunin-Issho newsletter! The contents of each spring issue are pretty much decided in advance: of course the feature story is a report on the annual exhibition, and this is accompanied by Halifax to Hamura and another in the Sadako's Corner series. But in addition to this is something we certainly don't see very often in this newsletter - the announcement of a new print series! I hope you enjoy this issue of Hyakunin Issho! The events I have been writing about - working as the manager of the music store while exploring the woodblock printmaking 'hobby' - took place some twenty-odd years ago, so it's a bit difficult for me to recapture exactly what I was thinking and planning at the time. I'm a fairly good record keeper though, and down in my basement here in Ome there are a few things stashed away in boxes that are helping to jog my memory! Exhibit #2, another photo of the room. I had been ransacking used bookshops for anything related to Japan, Japanese history, or Japanese art, and those shelves climbed higher by the week. 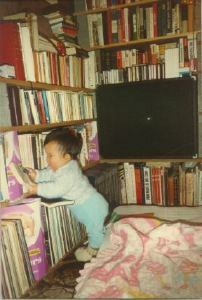 I can remember how eagerly I buried my nose in those books ... this guy who can't stand 'studying'. If I had been assigned such a task by a teacher, I would have given up, but when you are following your own nose, things are so different! Why not? 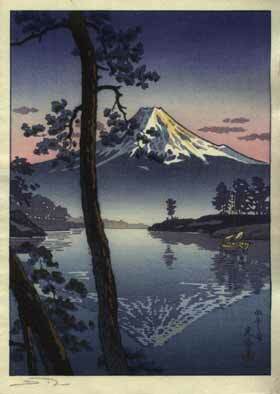 If I was so crazy about these Japanese prints, why wasn't I making more of them? My focus had changed a bit - because I didn't want to be in a situation where I was making prints as a hobby on the weekends, but rather wanted to be living prints, living and breathing them, I turned my energies towards figuring out a way to get an income from printmaking. And that leads to one more item I found stored downstairs: a binder full of records from my next endeavour - travelling woodblock print salesman! The owner of the music store knew that I was toying with the idea of trying to become a full-time printmaker. 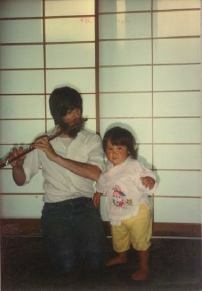 He had even given me that previous three month leave, knowing full well that I was 'scouting out' the scene in Japan to learn what I could. It is indicative of just how tolerant he was that not only did he not complain about these activities, but even assisted them. It seemed to me that people attending many of the craft fairs that were held at various locations around the province would be interested in seeing a woodblock print craftsman at work, so I matted and framed a selection of my prints, prepared a knock-down display unit on which I could show them along with explanatory materials, set up bank and sales tax accounts, collected all the information on fairs that I could get my hands on, sent off a batch of application forms, and started a side-career as a printmaker craftsman, scheduling my days off from the music store to coincide with the dates of the fairs to which I attended. 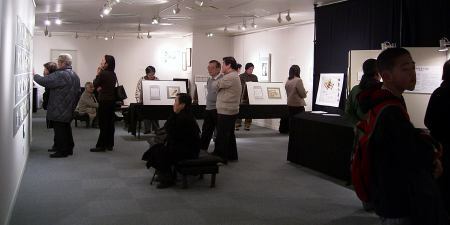 Exhibition number 15 - ten years of Hyakunin Isshu poets, and now five years of Surimono Albums! 15 x 10 = 150, and that's how many prints should have been finished by this point, but I didn't quite get the newest set of ten done in time for the exhibition - in fact I'm still working on the final print! But there were plenty of interesting things on display to be enjoyed by people who attended the show. These exhibitions are really the only time that I too get to see the prints all laid out for inspection, and once the eight completed prints from this album were all up in place on the display panels, I could see that Album #5 really is quite a bit more ... what word shall I use ... 'spectacular' than the previous albums. I have gone a bit overboard with the use of 'special' effects, metal printing, embossing, and using a large number of colour blocks. Part of the reason for this is that - even after nearly twenty-five years since starting to make traditional Japanese woodblock prints - I still feel a bit like a kid in a candy store ... I want to 'have' everything! Hopefully though, the collectors are enjoying the journey through this album, and the comments I heard from visitors to the show seem to indicate that they are! This corner is now well established as a regular part of the exhibition, and my only regret is that I didn't have this idea many years ago. I had previously considered the exhibition to be for the purpose of showing my own work only, but now that it has expanded to include older prints from my personal collection, it is far more interesting for visitors. In the David's Choice corner this year, I included a wonderful 'Japanese' woodblock print made by an Englishman back near the beginning of the 20th century, an original surimono from over 200 years ago, a most interesting Meiji-era book of woodblock reproductions of paintings, and a number of other interesting items. Perhaps some of the visitors find this corner more interesting than my own work - but that's a risk I'm willing to take ... these prints are just so beautiful, I have to show them to everybody! Oh, what can I say about the Gallery Talk? I got myself into the same 'problem' as last year - there are just so many interesting points to talk about that I just keep tripping over my own feet trying to get them organized into a coherent stream for the listeners! People seemed to be fairly patient with my clumsy delivery, but I know that the ideas should be much more smoothly presented. With only one chance each year to 'practice' though, how will I ever get much better at this? Perhaps for next time, instead of trying to 'do it myself', I should rope in a few of the collectors, and make it into a kind of panel presentation. After all, people aren't coming just to see David, but to hear an interesting presentation ... So I'm open to suggestions from any of you! One of my major concerns for this year's exhibition had been the gauge of how much interest there is going to be in the new series coming up, so I prepared a small display outlining my plan (see the separate story in this newsletter). Much to my relief, interest was very high, and quite a number of the people who attended placed orders for the series, even though I'm still not yet finished the current album. All in all, it was another good exhibition. Media interest was low, as it has been now for a few years, so we didn't have a great number of 'new' attendees, but there was still a constant stream of guests during the six days. Everybody seemed to enjoy the work on display, I had a chance to see again many people I only meet once a year, and I had a nice break from my workbenches! 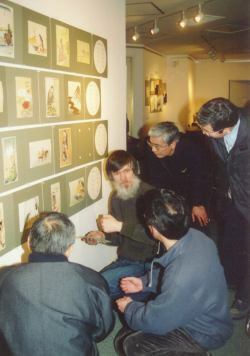 There are very few readers of this newsletter indeed who can remember visiting an annual exhibition of mine at a location other than the Takano Gallery in Shinjuku. For 12 years in a row, Takano has been my January 'home', but this must now come to an end, as the Takano company has decided to close down their gallery. I had been quite lucky to find the Takano gallery all those years ago; I had looked in a gallery guidebook for a suitable location to hold my first downtown exhibition. I didn't realize it at the time, but reservations for most galleries had to be made up to a couple of years in advance, and I was looking for a place to hold an exhibition just a couple of months later. Most of the places I looked at were all too small, or too gloomy, or unsuitable in one way or another. The Takano gallery wasn't listed in that guide I was using for my search, but on the way to inspect another place I bumped into their entranceway by chance and decided to go inside and take a look. It looked very suitable, and they did have a space available during the period I wanted - early January - but when they told me the rental price - 100,000 yen for each 8-hour day - I was quite shocked. The amount for each day was nearly double what I had previously paid for an entire week at a local gallery near my home. Crazy or not, I decided to throw all my chips on the table and give it a try. I didn't have much experience, so my first exhibition there was not well produced and very sparsely attended, quite a disaster actually. 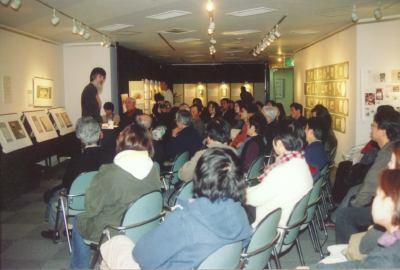 As time went by though, I acquired the ability to put together an interesting and attractive exhibition, and over the years, the exhibitions at Takano have been a wonderful string of successes. Of course, as soon as we heard the news this year that Takano was going out of business, Sadako and I began the hunt for a new space. Tokyo is a very big city, but there are actually not many galleries that meet my requirements: a large space, clean and well maintained, available for rental year-on-year, with an easy-to-find location, and of course, available when I need it - in mid-January. After a sometimes frustrating search, we finally found one that seemed to fit the bill, and I have booked it for next year (and presumably subsequent years). So we are leaving Shinjuku and moving to Yurakucho; the next exhibition will be held in the Gold Salon of the Kotsu Kaikan building just a few short steps from JR Yurakucho Station. We will be able to mount a very attractive show in this space, and as the building is located right in the middle of the Hibiya and Ginza districts, it will be very easy for attendees to combine other activities to make a day of it when coming to the exhibition. If things go well, we are looking forward to a long association with this gallery. I certainly hope so; we would hate to have to go through this search process again! See you in Yurakucho next January! After five years of making Surimono Albums, I think it's time to take a break and work on something else for a while. I certainly don't think that I have 'mined' all that I can from those Albums, and indeed, will probably return to do another one next year, but a bit of a break won't hurt any of us - collectors or printmaker! Having a 'change' isn't the only motivation for this though; collectors of my work have of course noticed that I have been falling farther and farther behind the nominal schedule. I have not been able to keep to the 'one album each year' pattern, and as I write this in spring 2004, I still have not yet finished the 2003 Album - it will take me at least another month. So I thought that it would be a good idea to make a shorter set of prints for 2004 - something that I could complete by the end of the year and thus pull myself back on track. My exhibitions are booked years in advance, and I have no wish to alter the established pattern of holding an annual exhibition each January. By designing a set of four prints, I should be able to have it completed in time for January 2005. 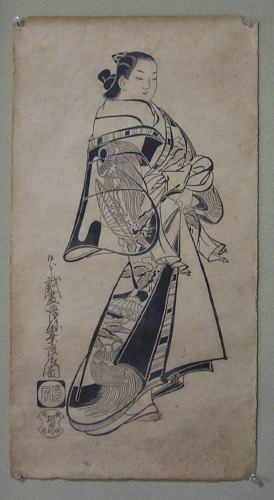 The theme wasn't too difficult to 'find' - collectors have been after me for years to make more prints of the 'bijin-ga' type (literally: beautiful woman pictures). Now I don't make prints 'to order', but I too am interested in doing work like this, and when I was thinking over many possible ideas for the new project, this one bubbled up to the top. Work on the first print in the set should be under way by early May, and the four prints should go out at approximately two-month intervals from June. I hope you will find this new series interesting! After finishing the annual exhibition we decided to treat ourselves with a short trip to Hong Kong, which is a place I had never visited. David had been there about 20 years ago and said "It is a very exciting place, and the food is great. You had better eat lightly before we go!" I - a bit of a gourmand - was quite excited to hear this and eagerly awaited the upcoming food experiences. We set off full of anticipation but ... how do you think we actually fared? We usually walk a lot during our trips. We ride trains and subways where appropriate, but we believe walking is the best way to observe and experience a new place. We have never been bothered by walking a lot, and inevitably only start looking for a place to eat when our stomachs start to send the signal. Of course we avoid tourist restaurants and look for those that seem to be catering to the locals. Our first few 'at bats' were not particularly successful, but then we came across a casual looking restaurant with a number of people standing in line at the entrance. The lady standing there spoke no English, but our gestures of two fingers told her all she needed to know, and we were soon led to a couple of free seats at a larger table. We were happy to have been seated so smoothly, but when we were handed the menu we saw it was all in Chinese! And the number of dishes was enormous; it was impossible to know what to choose! Just when we were almost ready to give up, the couple sitting across the table smiled at us; we couldn't miss this chance! We tried to speak to them with simple English, and they responded in a very friendly way ... in Chinese. They didn't care whether we understood or not and continued to speak Chinese. What should we do? We were really hungry and reluctant to look for another restaurant, so tried desperately to communicate in sign language. Our faces must have been rosy with excitement. "Could you please choose dishes for us? Anything to fill our stomach!" We used not only hands but also all the muscles in our faces. Success! Finally the man nodded, took the menu from David, and carefully scanned it and ordered a few dishes for us. How relieved we felt! Soon two pots and cups appeared in front of us, but when I poured, only hot water filled the cup. "This is not tea ...!" The man in front of us reached across and showed us what to do. This hot water was just to warm the cups; tea was in the other pot! The taste of the tea was a bit strange; "This smells moldy. Do you think it is safe to drink?" I asked David. "Everybody else seems to be drinking the same tea; it must be OK." After a while, dishes started to come to us one by one - a selection of tasty-looking dim sum! I bit into one, and got a mouthful of succulent shrimp. As we continued eating we must have looked happy, and the couple looked at us and asked "Gooodo?" "Yes, good ... gooooood!" Our own English turned out a bit strange but we were happy with good food. And once we were eating, the taste of the tea didn't seem as strange as it had at first. Maybe it was a special kind of tea. Our stomachs were filled and we were very satisfied. When we paid the bill we found everything amazingly cheap. Home run! I would like to mention another 'hit', this one in a large market area. We had wandered in fascination around the piles of interesting and unusual foods until well past lunch time. We switched the focus to finding a place to eat, and came across a small family-operated restaurant. It felt 'right' so we went in. As we expected, they spoke no English at all, but the man in charge behaved naturally and we felt very comfortable. As the menu was quite simple we were able to decipher enough Chinese characters to guess at some of the dishes, and ended up with some home-made hot and juicy dim sum, some pretty casually cooked greens, and a heaped bowl of steamed rice. Everything was very tasty! We Japanese tend to think that rice in China is not as tasty as ours but cooking magic served us delicious rice! The simple meal at this very casual restaurant was the best of our trip. And the bill was so small that we couldn't believe our eyes! Honestly saying these were our only two 'hits'. We had also tried some slightly more upscale restaurants (at least of a type where we could enter in jeans and sneakers), but we struck out at almost all of them. At one place, the tea and pickles we were served as starter were so delicious that we were expecting nice food, but nothing else was any good! We accept all these experiences as part of the pleasure of travelling. The hits and strike-outs together make a collection of sweet and sour memories. The return leg of these discount package tours is always an early morning flight, so we had breakfast in the plane. When we bit into the bread we looked at each other and smiled, "Tasty, isn't it ..."
I have again fallen behind in giving credit to the people who help me put this newsletter together; Ms. Akemi Doi has been translating the Halifax to Hamura story for years now, wondering when I will ever get to Hamura; Sadako Ishizaki does all the other stories, and provides some of the photographs. Collector Mr. Takeshi Udagawa also sent me a package of exhibition photographs, some of which appear in this issue. Thank you to you all!